In the summer of 1906, revival erupted in the newly-formed congregation meeting at the small, run-down Apostolic Faith Mission at 312 Azusa Street in Los Angeles. Critics attacked the congregation because its mild-mannered black Holiness preacher, William J. Seymour, preached racial reconciliation and the restoration of biblical spiritual gifts. The Azusa Street Revival, as it became known, soon became a local sensation, then attracted thousands of curiosity seekers and pilgrims from around the world. The spiritual intensity of the revival was red hot for over three years, making Azusa Street one of the most significant Pentecostal centers in the early 20th century. 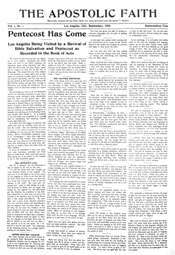 The Azusa Street Mission published a newspaper, The Apostolic Faith, which reported on the revival in Los Angeles and emerging Pentecostal movement. The newspaper, which featured letters and articles from around the world, shared the excitement and passion of these early Pentecostals. The Apostolic Faith is an essential resource for those interested in better understanding the themes, beliefs, people, and events that helped to shape the contours of the global Pentecostal movement. This online collection features thirteen issues, published between September 1906 and May 1908. The originals were deposited by the Fred Corum family at the Flower Pentecostal Heritage Center.